Once again. The Toshiba Thrive had a rough start on the American market. Toshiba is now trying to bring the device to users in Europe under a different name. Read here, what the AT100 is capable of and how it fares in comparison to famous brands. The tablet market is highly competitive, and virtually every major manufacturer tries to gain ground with its own tablet. 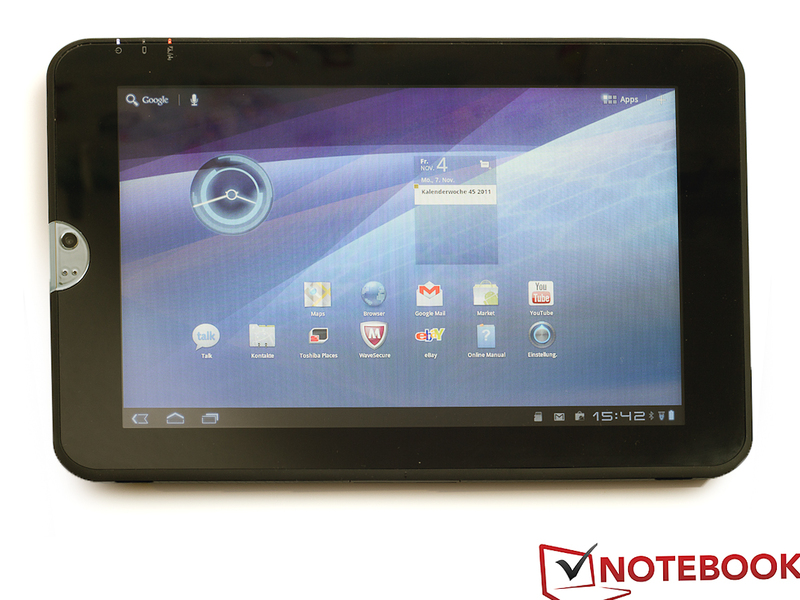 Toshiba tried to launch the AT100 tablet under the name "Thrive" in the USA. But it only had moderate success there. Not least did various teething problems make the tablet's life hard. Enough time has passed to straighten these out and now we hold the version for the European market curiously in our hands. We will examine whether Toshiba has been able to really eliminate the growing pains in our review. 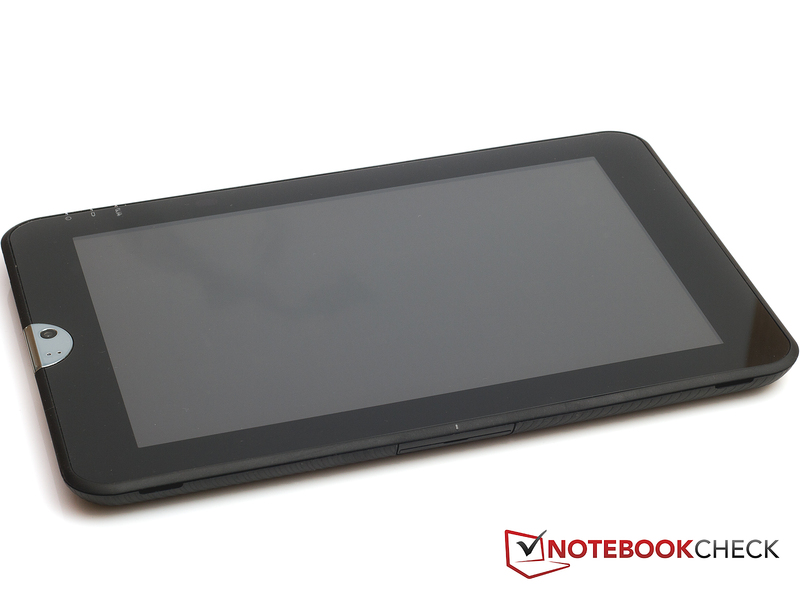 The Toshiba AT100 Android tablet is completely made of plastic. 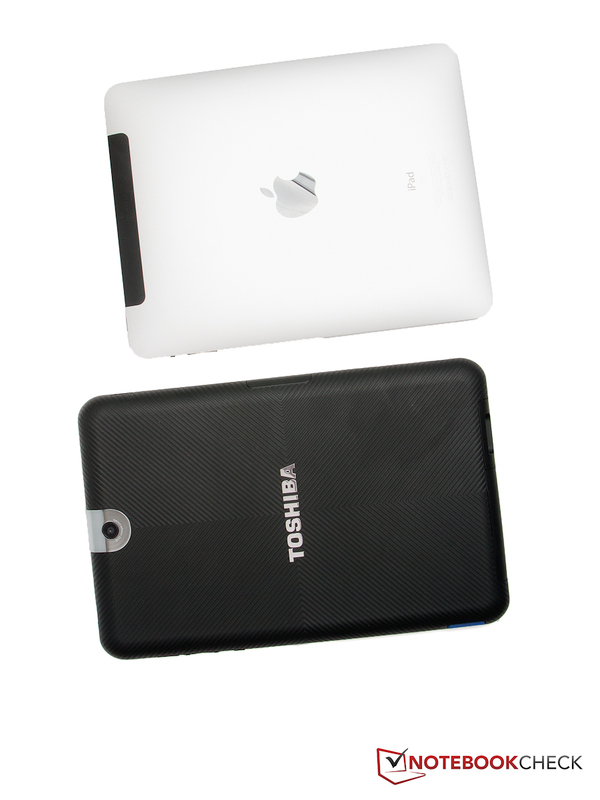 Toshiba takes a different approach compared to many other competitors, since their tablets are either completely or at least partly made of aluminum or alloys. The entire front is, as common for tablets, dominated by a big glass plate. The screen is underneath this. The flipside is enclosed by a big plastic surface. A line pattern has been incorporated in the plastic and is to provide a better hold than, for example, a smooth surface would. 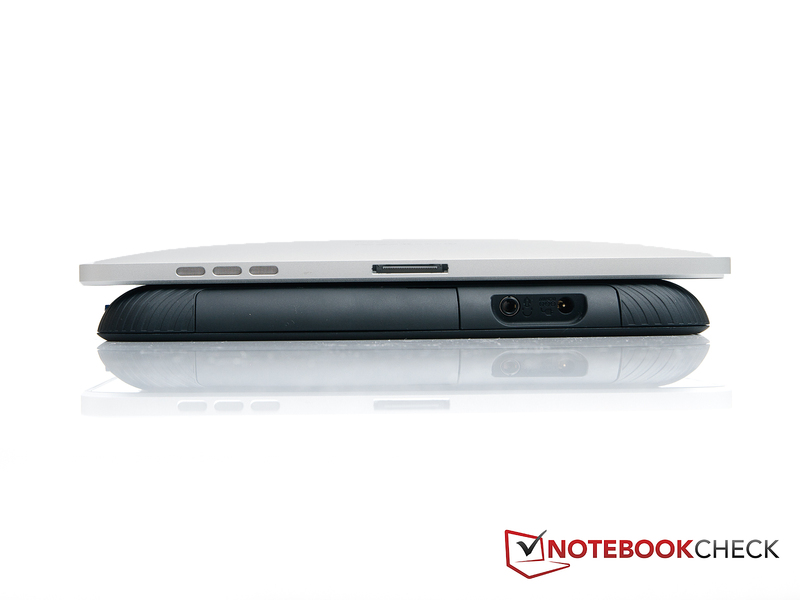 Moreover, the surface has a rubber coating that gives additional grip. The tablet doesn't make the best impression in terms of quality. Irregular gaps around the screen are only a part of the flaws that we noticed. While the gap is as good as closed on the one side, the other has a width of several millimeters. These gaps are predestined for accumulating dirt especially on the front. Even the flipside has its drawbacks. When pressing the plastic rear part, it can be warped with ease and the case emits a creaking noise. The plastic cover plate for the interfaces also doesn't make a trustworthy impression. 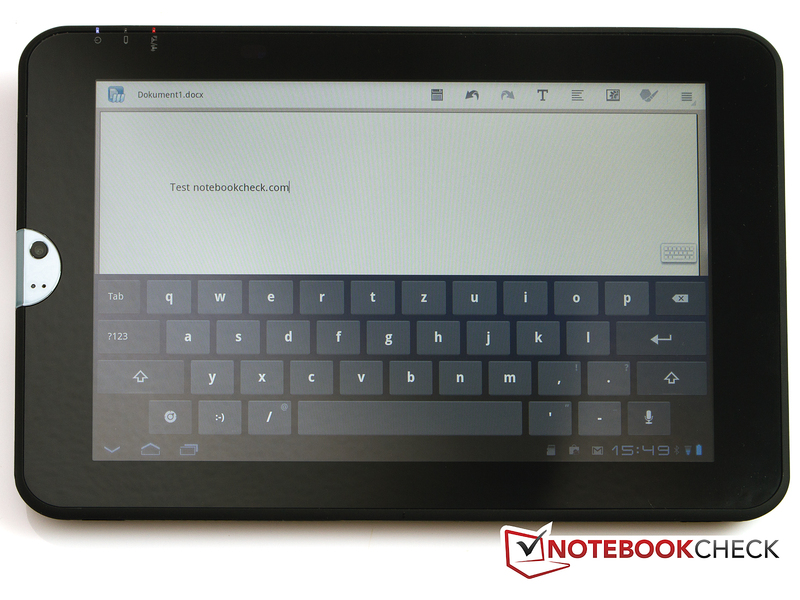 The Toshiba AT100 tablet can score in connectivity. While many tablets sooner cutback on interfaces (in particular the iPad), we can almost speak of diversity on the Toshiba AT100. In addition to the usual headphone and power jacks, it has 2 USB ports (1 USB 2.0, 1 mini USB) and a HDMI port. The card reader has to especially be mentioned. 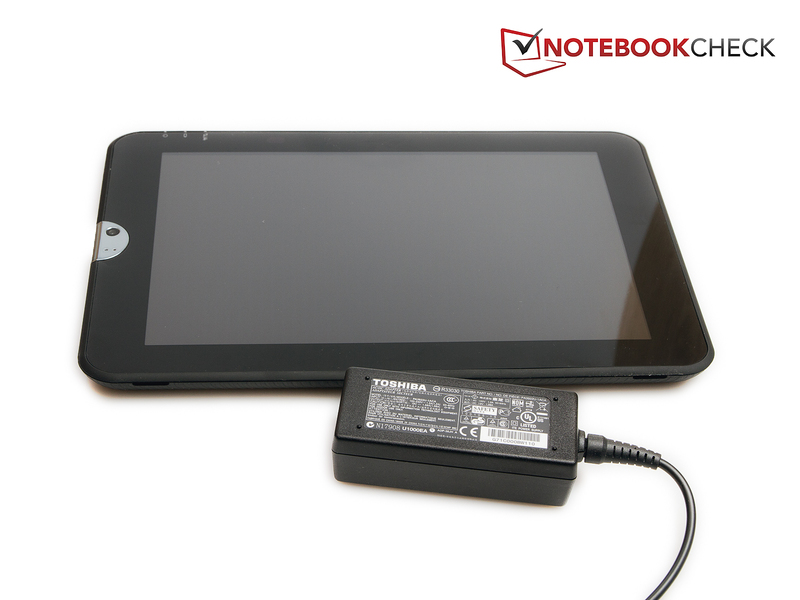 It allows the tablet's memory to be expanded up to 32 GB with standard SD cards. 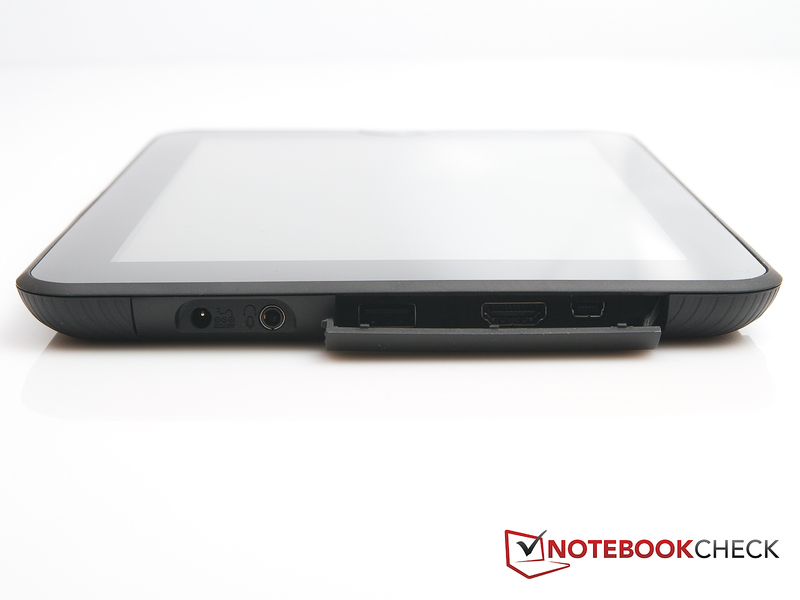 The tablet also has a docking port located on its left. However, the dock isn't included in the scope of delivery and has to be purchased. Although it is advertised on Toshiba's homepage, we couldn't find a German online shop that is currently selling the dock. From online forums it becomes clear that it either has to be obtained from abroad or be explicitly ordered over an authorized Toshiba dealer. 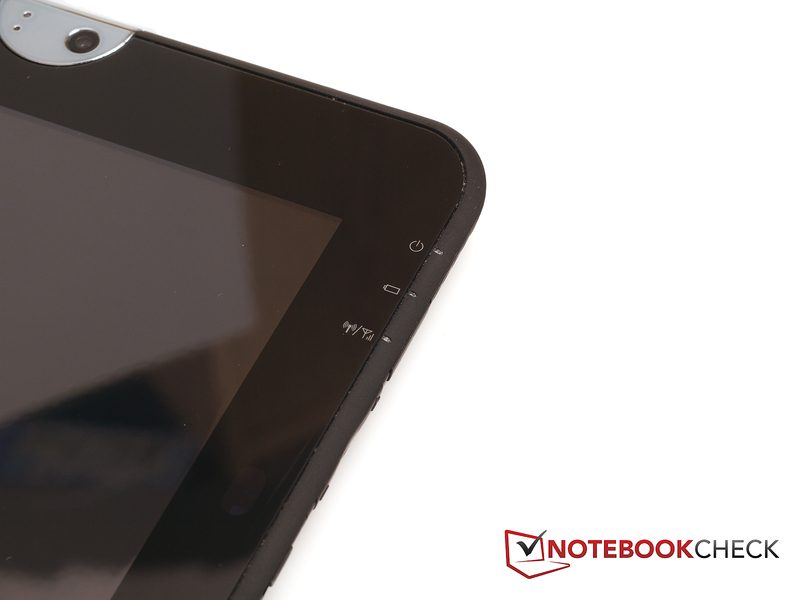 The Toshiba AT100 tablet offers wifi and Bluetooth as communication options. While WLAN is available in 802.11 b/g/n, Bluetooth is version 2.1 +EDR. A UMTS version of the tablet has not yet been announced. 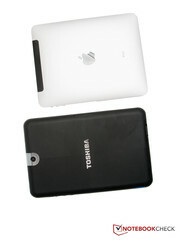 Toshiba delivers the AT100 tablet with a 1 year international bring in manufacturer warranty (Europe, Mideast, Africa) incl. an onsite pick-up service in Germany and Austria when the repair is registered via the Toshiba notebook hotline. Toshiba doesn't use a self-created keyboard and relies on the Android 3.1 keyboard. Its size varies depending on how the tablet is held. The keyboard's responsiveness is impressive. However, there is no palpable feedback like on a real keyboard. Although an attempt has been made to compensate this with key tones or vibrations on the tablet, it is remote from that of a real keyboard. The touchscreen proved to be reliable in the test. The touchscreen's responsiveness is very good, and comparable with the iPad's. The touchscreen only lacks the precision of a few competitors. The wrong item was occasionally hit on smaller buttons. However, this hardly ever carried weight in routine use. Surfing and navigating works perfectly despite these minor inaccuracies. Voice entry will likely be of more interest than the keyboard in the future. It should then be possible to dictate texts to the tablet with its assistance. However, voice entry proved to be unusable in the test. The spoken sentence was only written properly in the fewest cases. Although we spoke carefully and clearly, words were left out or completely misused. It seems that voice recognition is more a gimmick than a useful feature here at the moment. The Toshiba AT100 has 2 cameras: One 2.0 megapixel camera on the front and one 5.0 megapixel camera on the flipside. Neither camera has a flash. While acceptable pictures can still be made in daylight with the rear-sided camera, the front camera couldn't convince us. Details aren't very clear and they also have an intense red-orange hue. 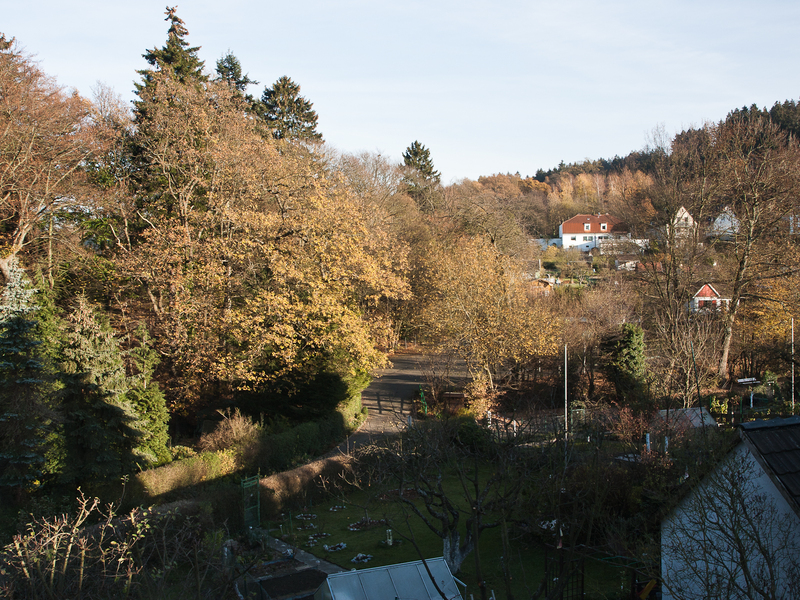 The pictures look over-saturated and "faded". 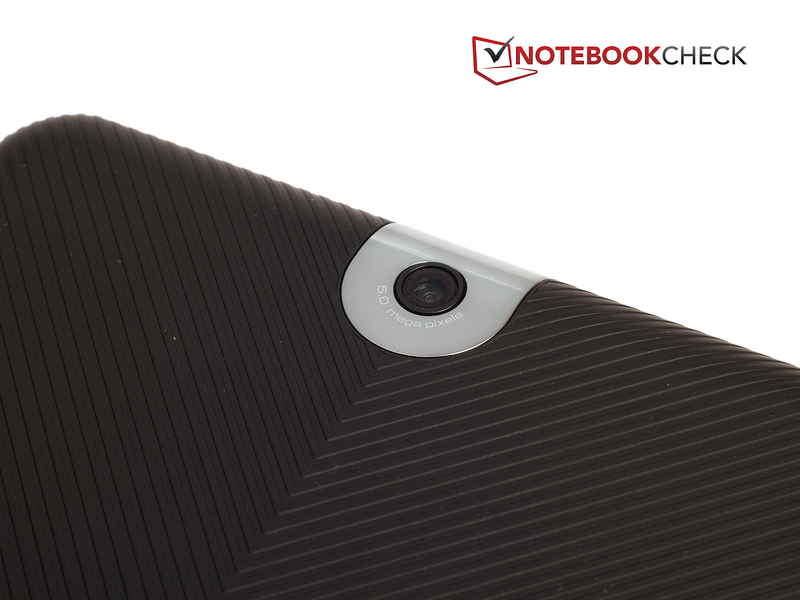 In contrast, the pictures of the rear-sided camera seem to have a slight blue cast. The Toshiba AT100's 10.1 inch screen has a resolution of 1280x800 pixels. Thus it's quite suitable for rendering HD (720p) videos. If 1080p videos are to be watched, an external monitor has to be used. A TV can be connected to the tablet via the HDMI out without further ado. The screen is cloned no matter if the menu or an App is opened. The sound is also transmitted to the TV via the HDMI cable. The tablet didn't have any problems transmitting Full HD (1080p) videos to a Full HD TV and rendering them smoothly. 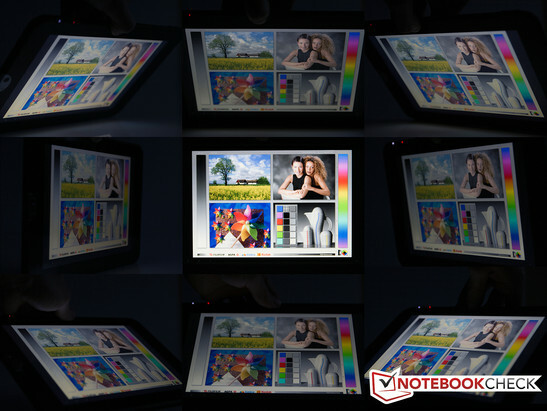 The tablet's screen can serve with an average brightness of 218.6 cd/m2. In comparison to other tablets, the Toshiba tablet doesn't do very well here. Other tablets achieve brightness rates of around 300 cd/m2 (compare iPad 2: 390 cd/m2). A low black value of 0.28 cd/m2 ensures a good contrast of 807:1. However, the screen struggles with fingerprints. They naturally can't be prevented on a touchscreen, but compared to the iPad the Toshiba AT100's screen seems more susceptible to them. The screen's legibility suffers due to the reflective surface outdoors. The tablet would have needed considerably higher screen brightness so that a bit of the content is visible in direct sunlight. 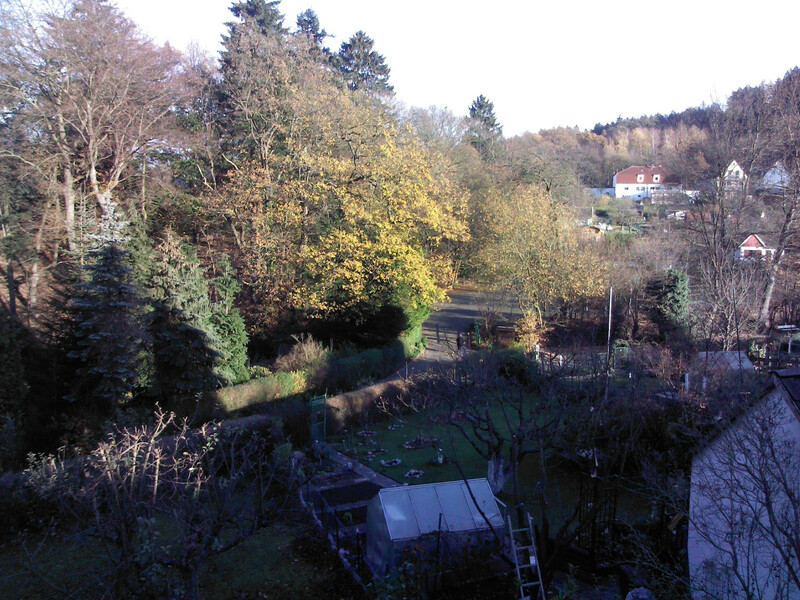 Not much of the content can be seen when the sun shines directly onto the screen. The screen content can again be seen in the shade, but intense reflections are still an issue here, too. 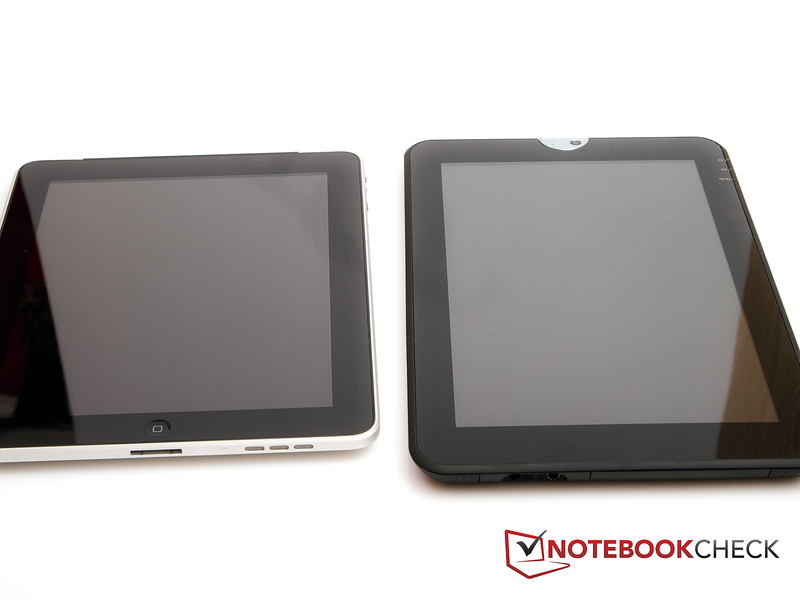 While notebooks usually come with low-cost TN screens, the more expensive IPS (in plane switching) screens are used in tablets. The difference between both screen types can be seen in the viewing angles at first glance. While TN screens only have constrained viewing angles, the image can be seen on an IPS screen virtually from every angle. Before the image on the touchscreen is distorted, the reflections on the display make it impossible to see anything on it. The Nvidia Tegra 250 is not a processor in the usual sense, but a SOC (system on a chip). The Tegra 250's system is made up of a dual core ARM Cortex A9 processor, a GeForce ULP graphics card, a DDR2 memory controller, video encode and decode processors, an audio processor and an ARM7 core for management functions. The Cortex A9 dual core processor serves as the calculating processor. It has a clock of 1.0 GHz. Although the Cortex processor's computing power per MHz is lower than comparable x86 processors (for example, Intel Atom, AMD C series), a well modified operating system can compensate this difference. A GeForce ULP graphics takes care of video output. According to rumors, it's allegedly based on the GeForce 7 series. The GeForce ULP graphics card has 8 cores (4 pixels, 4 Vertex shaders). Since the graphics card doesn't have a dedicated memory, it uses a part of the main memory (shared memory). It is also possible to operate two simultaneous outputs with the GeForce ULP. A maximum resolution of 1920x1080 pixels can be transmitted via the HDMI out, while the internal LCD can be used with a maximum resolution of 1680x1050 pixels. The processor hardly ever reaches the full clock rate of 1.0 GHz. It isn't put under such high load most of the time. The processor usually clocks with 216 MHz during normal use, for example Internet surfing. The clock rate of 1.0 GHz is only reached when the processor is put under load, i.e. a 1080p Full HD video or a complex game. Of course, the battery life benefits from this. The lower the processor is clocked, the less power it consumes. The Toshiba AT100 doesn't achieve any top rankings in the first benchmark, Browsermark, but it also just skids by the third place. 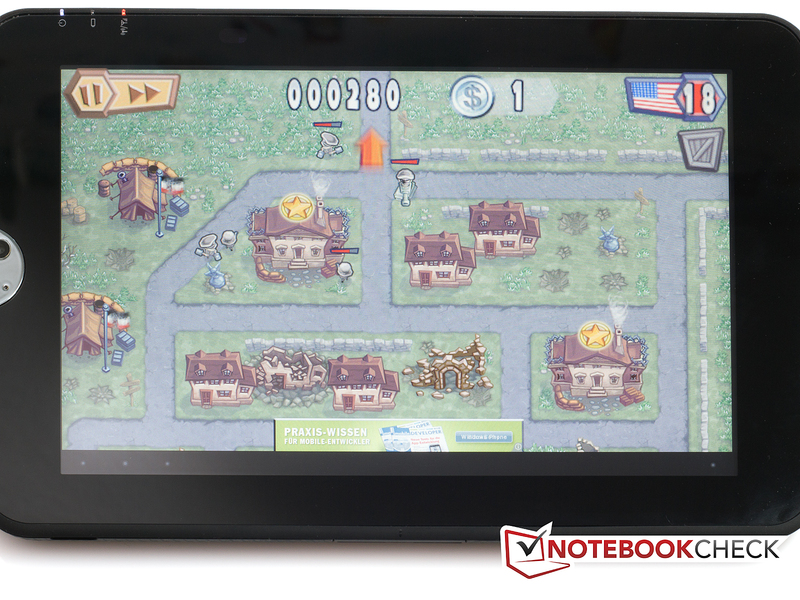 The achieved 87538 points aren't enough to beat the Motorola Xoom (Android 3.0, Tegra 250) after all. Nevertheless, the Toshiba tablet is definitely impressive. 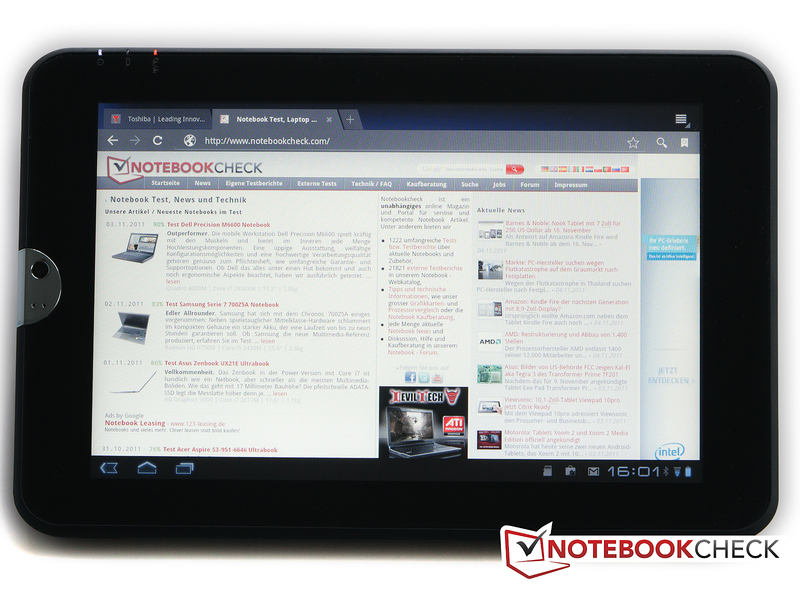 The tablet can also mingle in the front field in the Google V8 benchmark. With 665 points, it only scores slightly poorer than the Asus Eee Tab Transformer TF101 (Android 3.0, Tegra 250). The Toshiba AT100 starts to falter in the Quadrant benchmark and drops to the last place with 1523. The result hardly changes despite several runs. The tablet can catch up again in the Smartbench benchmark: It is again in the front third with 2390 points in the productivity benchmark and 2672 points in the game index. The AT100 manages a score of 2190 milliseconds in the Sunspider benchmark. It is therewith minimally slower than most other Tegra 2 processors, but still is at the front. The last benchmark that the Toshiba AT100 had to pass was the Linpack for Android benchmark. The tablet reached a score of 54833 points here. 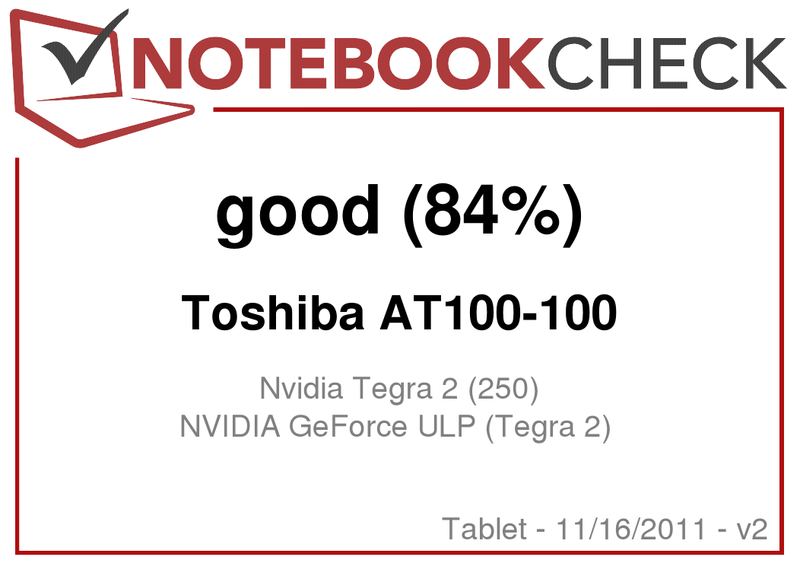 Thus, the Toshiba AT100 is the number one in this benchmark. 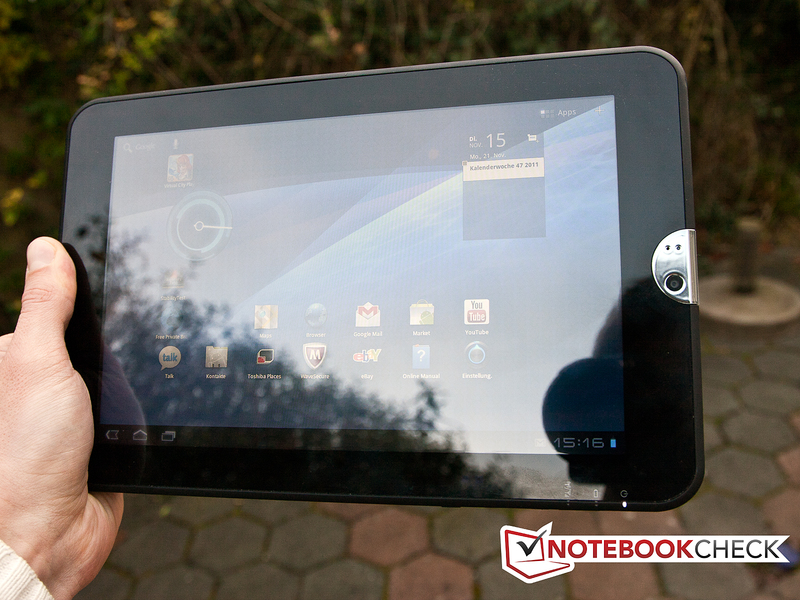 The Samsung Galaxy Tab 10.1v (Android 3.0, Tegra 250) has been dethroned here. 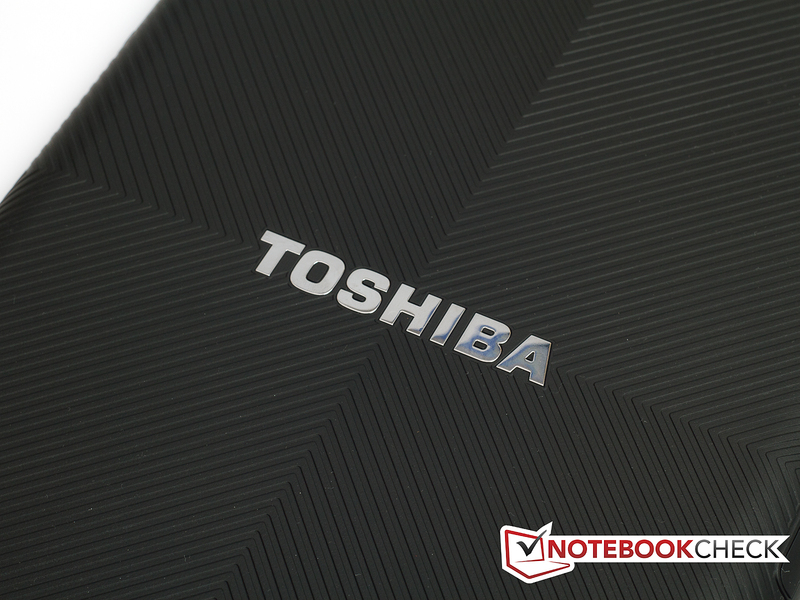 Overall, the Toshiba AT100 delivered a satisfactory amount of performance, which is actually sufficient for all applications that can be executed on a tablet. Users who want to watch a video on the move have two options installed directly on the Toshiba AT100. First, there is the Google Player and second, a player from Toshiba. Both players managed most of our test clips decently. The sound and not the picture was rendered in merely one .avi file. Beyond that, the HDMI jack proves to be very handy especially in entertainment matters. Simply connect the HDMI cable to the TV and the tablet's image is copied - on the TV of course and in the full resolution (up to 1920x1080 pixels). This enables showing home movies and YouTube videos or even playing a game on the TV. The vast offer of the Android market naturally includes games. They range from simple, free board or card games up to complex, fee-based 3D games. The Toshiba AT100 is well-equipped for games with its hardware. We looked at a few of these games during the test and didn't establish any problems. As mentioned in the beginning, the American version of the tablet still had teething problems which caused the tablet to crash frequently, among other problems. Hardly any of that was noticed on our model. 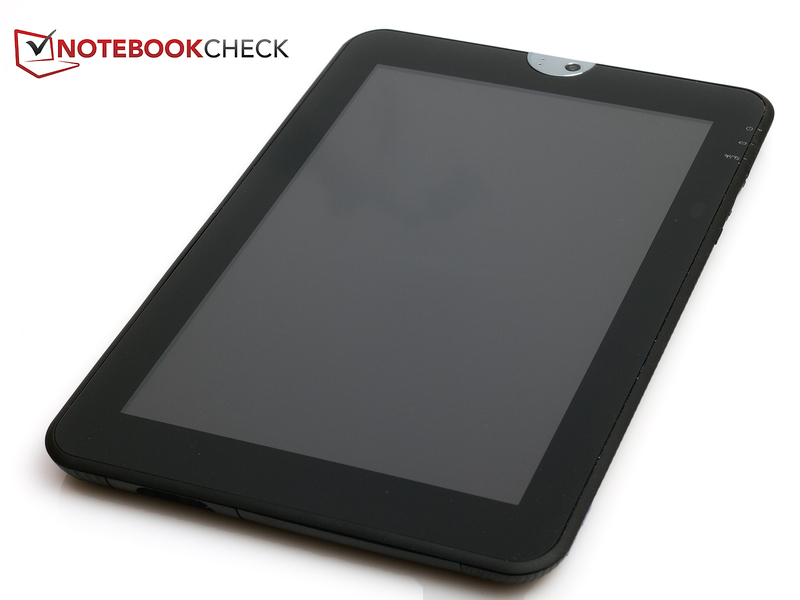 The tablet ran stably almost throughout the entire test period. Apps hardly ever aborted when opened or froze. A lot has been done here. After turning on the tablet for the first time, the number of apps is still limited. In addition to the standard apps, such as browser, Google, mail, the Android market, Google Maps, etc., there is Toshiba's File Manager, Toshiba's online manual, Toshiba's Places client, McAfee WaveSecure, Evernote, Adobe Reader and Toshiba's media player are found on the tablet. Since no movable parts, such as a fan or HDDs, have been built into the Toshiba AT100, the tablet works absolutely noiselessly. The only noise that we noticed during the test was the power adapter's quiet hum. The tablet hardly increases its temperature when idling. The maximum temperature on the screen side is 28.2 degrees Celsius, while the flipside's maximum temperature is 26.4 degrees Celsius. The temperatures increase slightly during load. The front now has a maximum temperature of 31.1 degrees Celsius. Since a tablet is held in the hand during use, it is vital that it doesn't get too hot. The Toshiba AT100 can score in this exercise without difficulty. (+) The average temperature for the upper side under maximal load is 25.5 °C / 78 F, compared to the average of 30.7 °C / 87 F for the devices in the class Tablet. (+) The maximum temperature on the upper side is 31.1 °C / 88 F, compared to the average of 34.8 °C / 95 F, ranging from 22.2 to 51.8 °C for the class Tablet. (+) In idle usage, the average temperature for the upper side is 23.1 °C / 74 F, compared to the device average of 30.7 °C / 87 F.
Both speakers on the tablet's left aren't a sound sensation. They are comparable with low-end notebook speakers. They lack bass and the sound makes a somewhat tinny impression. However, they suffice to play games, surf on the Internet or watch movies on the go. When a movie is transmitted to the TV at home, the TV's speakers or a sound system can be used because the HDMI out also transmits the audio signal. Thanks to the economic components, the Toshiba AT100 Android tablet achieves consumption rates that notebooks can only dream of. However, the Toshiba AT100 is a tablet and not a laptop. Compared to other tablets, the consumption rates only look moderate: It is on a par with the competition in view of 1.6 watts - 4.8 watts in idle. It is a bit more saving than the average during load with 5.5 watts - 6.3 watts. It's partly not easy to make a clear statement about the battery life because the screen has to be tapped every 30 minutes in standby so that the device doesn't switch to sleep mode. This can hardly be managed during a normal test day with devices that have a battery life of over 10 hours. The full load assessment proves to be easier. The Toshiba AT100 manages a battery runtime of 4 hours and 15 minutes here. The result of video playback via YouTube is similar (wifi on, brightness 50%). The tablet reaches a battery life of 4 hours and 23 minutes here. 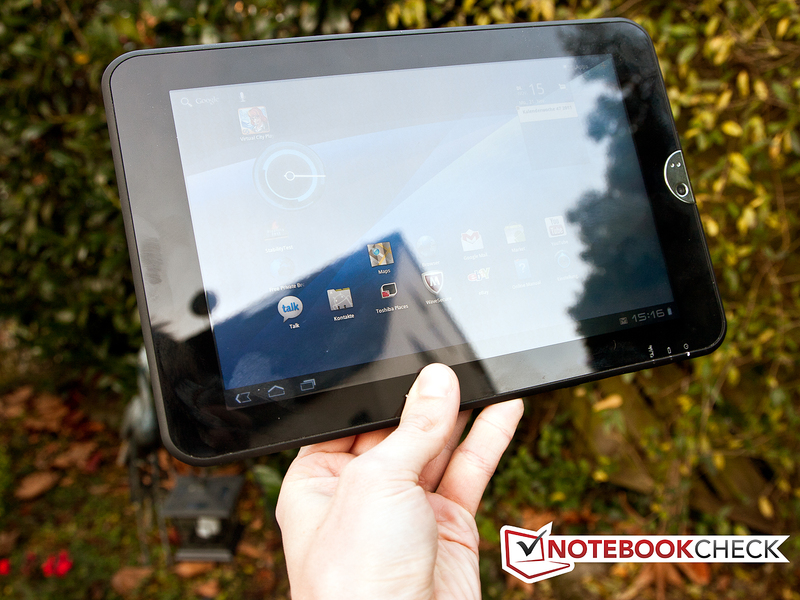 The Toshiba AT100 proves to be a fit Android tablet. 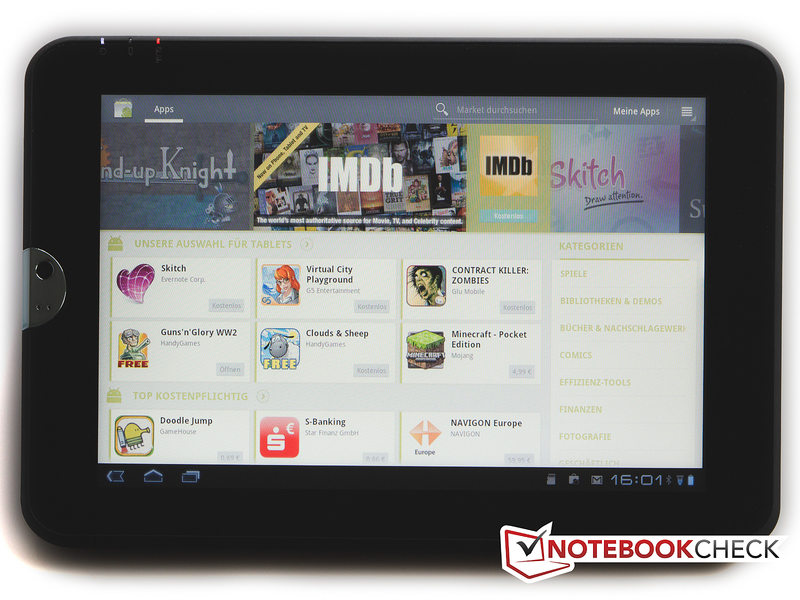 Thanks to the Tegra 250 processor, the tablet is up to pretty much every task that is in line for a tablet. Although the tablet doesn't reach the top, there's not much missing, either. We particularly liked the Toshiba AT100 as an entertainment tablet. 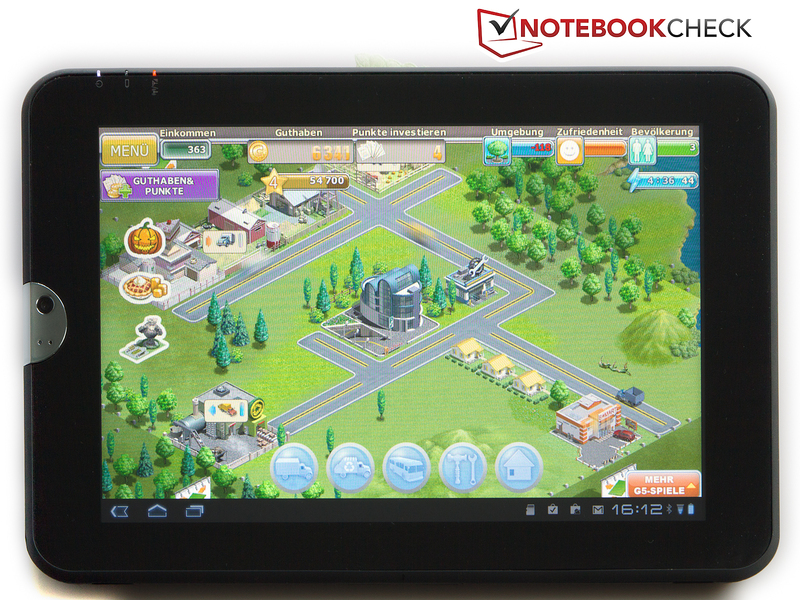 It is well suitable to play games from the Android store or watch videos on the go. However, the videos look a lot better when the tablet is connected to a TV. 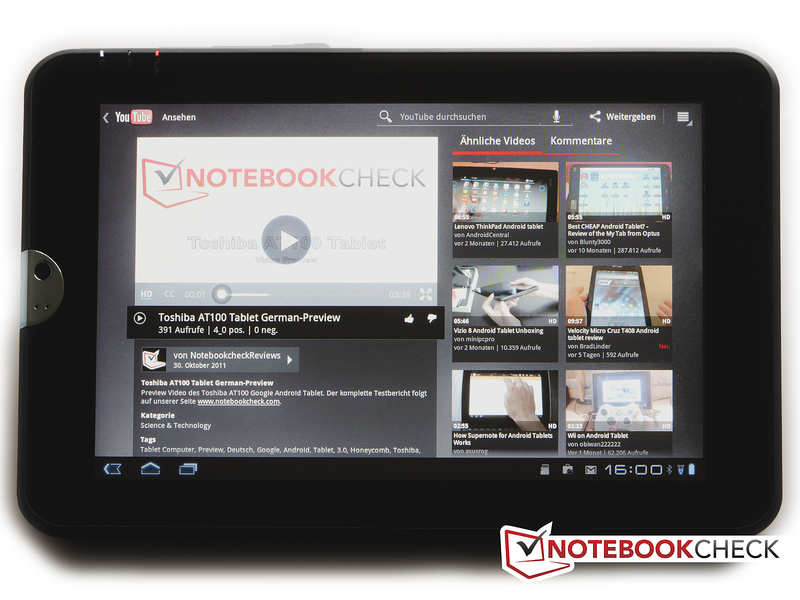 Buyers get a very good Android tablet with the Toshiba AT100 for a current street price of 379€. However, the device not only excels. In order to accomplish this price for the tablet, Toshiba has made cutbacks on the case. 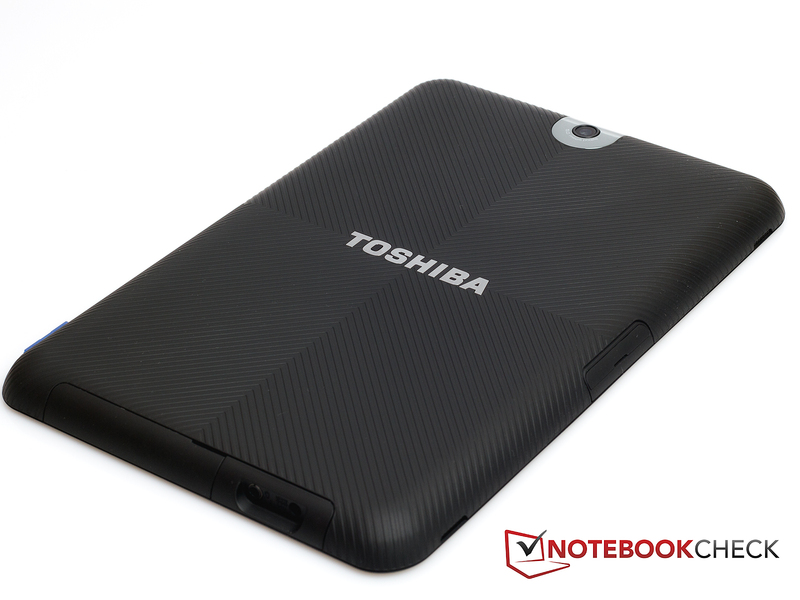 While the competition often relies on an aluminum case, a plastic case is used on the Toshiba tablet. The software problems of the primary US models on the market were hardly noticed. The Toshiba AT100 and its power adapter. The iPad juts out of the sides when placed on the AT100. The Toshiba AT100 is slimmer, but longer. The Toshiba AT100 beside the first iPad. The flipside has a rubberized line pattern. 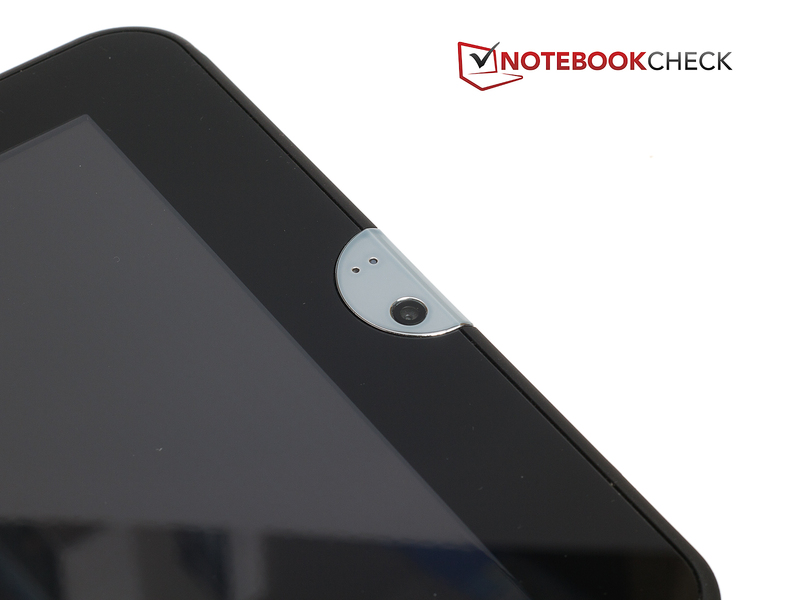 The 5.0 megapixel camera on the flipside. The 2.0 megapixel front camera. More interfaces are hidden behind a cover. and the controls below them. currently runs on Google's Android 3.1 Honeycomb. It's not easy to see anything on the screen even in the shade. We really liked the HDMI out and the associated flexibility of the Toshiba AT100. The tablet can be used as a multimedia device very easily with that. A somewhat better case made in a higher quality. That the docking station can't be found in any German online shop although it is touted on Toshiba's website. 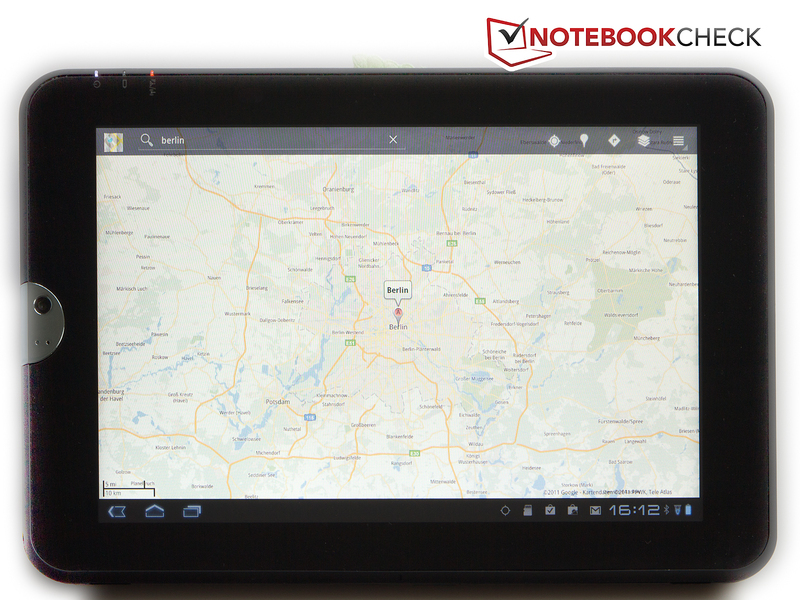 Is found on a large scale in our TOP 10 of tablets (German).